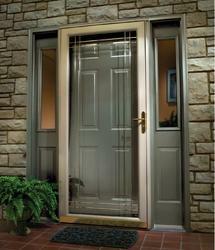 We are a recognized entity, engaged in providing the best-in-class range of Aluminium Door for our clients. Backed with huge industry experience and market understanding, we are involved in providing a wide variety of Aluminium Door and Windows for our valued patrons. Keeping in mind the ever-evolving needs of our clients, we are devoted towards offering an optimum quality array of Aluminum Front Doors. Being a leading firm in this industry, we are deeply engaged in offering a high-quality range of Aluminium Door. We are involved in offering a distinct range of Aluminum Doors and Windows that is available in different sizes and patterns. We manufacture and supply these Aluminium Doors and Windows as per the client’s requirements. We do complete quality checking of these Aluminium Doors and Windows before supplying these to our valuable clients.